﻿ Acts 26:15 "And I said, 'Who are You, Lord?' And the Lord said, 'I am Jesus whom you are persecuting. "But I said, 'Who are You, Lord?' "And the Lord replied: 'I am Jesus, whom you are persecuting. And I said, Who are thou, Lord? And he said, I am Jesus whom thou persecute. And I said, Who are You, Lord? And the Lord said, I am Jesus, Whom you are persecuting. I answered, 'Who are you, sir?' And the Lord said, 'I am Jesus, the One you are persecuting. And I said, Who art thou, Lord? He replied, I am Jesus, whom you persecute. And I said, Who are you, Lord? And the Lord said, I am Jesus, whom you are attacking. I answer'd, who art thou, Lord? he said, "I am Jesus, whom thou persecutest. And I said, Who art thou, Lord? And the Lord said, I am Jesus whom thou art persecuting. 'Who are you, sir?' said I. 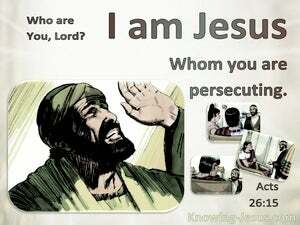 The Lord said, 'I am Jesus, whom you are persecuting. And I said, Who art thou, Lord? And I said, Who art thou, Lord? And he said, I am Jesus whom thou dost persecute. And I said, Who art thou, Lord? And he said, I am Jesus whom thou drivest out. And I said, Who are you, Lord? And he said, I am Jesus whom you persecute. So I said, 'Who are you, Lord?' And the Lord said, 'I am Jesus whom you are persecuting. 'Who are you?' I asked. And the Lord said, 'I am Jesus, and you are persecuting me. "'Who are you, Lord?' I said." And the Lord said: 'I am Jesus whom you are persecuting. So I said, 'Who are you, Lord?' And the Lord replied, 'I am Jesus whom you are persecuting. "I said, 'Who are you, Lord?' 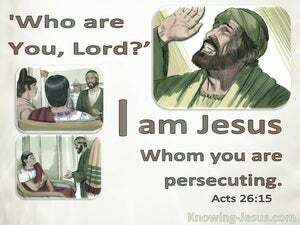 "He said, 'I am Jesus, whom you are persecuting. And I said, Who art thou, Lord? And the Lord said, I am Jesus, whom thou persecutest. And I said, Who are you, Lord? And the Lord said, I am Jesus whom you persecute. And, I, said - Who art thou, Lord? And the Lord said - I, am Jesus, whom, thou, art persecuting! Then I said, Who art thou, Lord? And he replied, I am Jesus whom thou art persecuting. "'Who art Thou, Lord?' I asked. "'I am Jesus whom you are persecuting,' the Lord replied. 'Who are you, Sir?' said I. 'I am Jesus,' the Lord said, 'whom you are persecuting. And I said, 'Who art Thou, Lord?' And the Lord said, 'I am Jesus, Whom you are persecuting. And I said, Who art thou, Lord? And He said, I am Jesus, whom thou persecutest.